Helen's ankle is still troubling her, so Jim does the washing up. They talk about how well Josh is fitting in with them all. HELEN: With any luck, we might have some peace and quiet in the Robinson household for a while. The hotel rings to say that a fax has come in for Jim and Helen from Paul. Caroline is exercising to a video. Christina has tossed and turned all night and doesn't think the police can protect them - someone could come in through the back! She's really unnerved about the call. But the court case is tomorrow, so it'll be over then. Gemma is nursing the possum which she has named Edna(!) 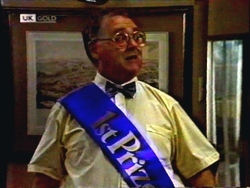 Harold is wearing his 1st prize sash for the cake competition, much to Madge's disgust. Harold has brought both cakes home and Madge wants to throw hers in the bin(!) and reckons that Harold only won by a fluke. 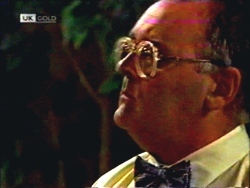 Also, Harold thinks he's more adept at keeping a house than Madge, which doesn't go down well at all. MADGE: Marvellous. From now on you can take over all the cooking and cleaning. I won't lift a finger around here. Put that in your cake bowl and mix it! Gemma is showing Adam the possum. He's impressed by her concern for the possum and he'll try to find somewhere she can keep him. They observe that there's still a police car at the end of the street and wonder why it's hanging around. Phil comes over to see the twins. They tell him about the threatening phone-call and Phil feigns innocence. He tells them that maybe they should just tell the court they didn't see anything, but the twins both think the safest thing is for the bloke to be behind bars. 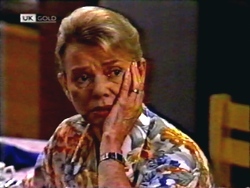 Phil tells her that the bloke's mates might come after them, but Caroline isn't convinced. 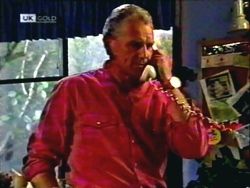 The phone rings and Christina answers it to Paul. Caroline asks Phil not to talk about reprisals in front of Christina - she's already very nervous. PHIL: Well, nothing will keep me away from being with you. Harold has put up a poster saying that his "prize-winning cake" is available for sale inside! 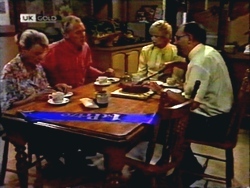 Jim and Helen are around and he invites them over for a piece. Madge glowers at him from the front of the Waterhole and makes her way over. 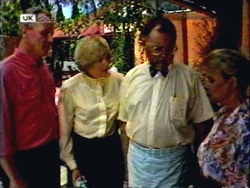 Jim and Helen tells her that Mr Henson is sending someone to assess the hotel, to make sure that Lassiter's is suitable. The person is going to be anonymous, so they'll have to be on their guard at all times. MADGE: That's all we need, some stranger lurking around and reporting on us. It's going to make the staff all tense and nervous. HELEN: Madge, I'm sure they'll come through with flying colours. 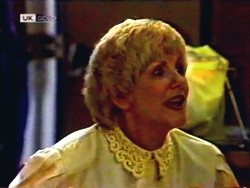 Jim warns her that the person could already be among them, so Madge dashes off to make sure everything is ship-shape at the pub. Harold wonders if he should open on a Sunday, but Jim assures him it's not necessary. Adam has found some numbers for a wildlife sanctuaries, so Gemma settles down to ring them. Helen comes around to see Pam and tells Adam that it's not any better. He has a look at it and thinks it should be improving by now - it's still very swollen and he suggests that Helen goes back to see her doctor: sometimes fractures can be missed. Caroline and Phil are kissing. She's really taken with him and tells her she's glad he's around - Christina tends to buckle under pressure. She always has to be the strong one. PHIL: I reckon you could get away with just about anything. He wonders if there's any way to tell them apart physically and Caroline says that Christina has a birthmark behind her right ear, but that's all. PHIL: So you could make someone believe you were really Christina? CAROLINE: Yes, I just put her clothes on, and I use her mannerism and yeah! Only someone that knows us really well could tell, but otherwise, no. Why? PHIL: Oh, just curious. I've never been out with an identical twin before. CAROLINE: Well, don't you dare mix us up! Christina's the married one, just remember that! Christina comes down the stairs, excited that Paul is coming home - she's going to meet him at the airport. Caroline warns her not to. 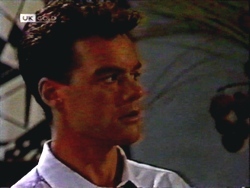 Phil suggests that he asks the police if he could take her to the airport - he could make sure she was safe. CAROLINE: Then I'll come as well. PHIL:(sharply) No! I could protect one, but two makes it a lot more difficult. Besides, I don't think the police would let both of you go. CHRISTINA: Well, if you could take me, I'd really like to go. PHIL: Sure. Let's go and have a word to your watchdogs. CAROLINE: You just look after my sister, you hear me? Harold is cutting up some cake for Helen, Jim and a reluctant Madge. Madge tells him off for cutting very small slices, but he counters that he wants to sell it in the Coffee Shop tomorrow. They talk about the police car and wonder why it's there. 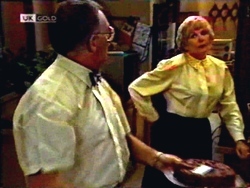 Helen tells Harold that his cake is absolutely delicious and encourages Madge to have a bit. MADGE: Harold, how come you put macadamias in your cake? HAROLD: Macadamias, no I didn't. There was no mention of them in the recipe, was there? MADGE: No, there wasn't. But I put some in mine because I thought it might give it a little extra flavour. And it certainly does. MADGE: This cake has macadamias in it. It's mine. MADGE: Is it? You took the cakes down to the church fete, didn't you. Now, is it possible that you got the nametags mixed up when you were setting the cakes up? HAROLD: I don't think so. I'm usually very careful, and you know that. HELEN: This cake certainly has macadamia nuts. MADGE: Oh, yes. It's mine. I won, Harold! My cake won. *You* didn't even get a place. HAROLD: Well, alright, alright, if that's the case, there's no need to gloat. MADGE: Gloat? What the hell do you think you've been doing?! Now the boot's on the other foot, isn't it?! (to Jim and Helen) Would you like a *decent* slice of cake? JIM and HELEN: Ooooh, yes please, Madge! HAROLD: Leave some for the Coffee Shop tomorrow! MADGE: Not this cake, Harold, if you want some for the Coffee Shop, you're going to have to make your own. And you'll have to take down that sign that says you're a prize-winner. Who's a poor loser now?! Paul arrives home, escorted by the police. Caroline is surprised that Phil and Christina missed him at the airport. Paul didn't see any sign of them, and demands to know what's going on. Madge is still lying on the sofa listening to music on her headphones. Harold is still sulking around the house, cleaning. 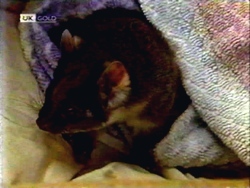 Gemma and Adam come in, full of beans, pleased that the wildlife park have taken the possum. While she was there, the man offered her a trainee job(!) He gave her an interview on the spot. It's only a trial, but it's a great opportunity. MADGE: Well, I think calls for little celebration! Harold, love, would you bring in some more of my cake, and make a pot of tea, would you? Paul is really shocked about what's been going on at home. He tells Caroline off for not telling him - he'd have dropped everything and come home if he'd known. They start to worry that Phil and Christina aren't back. CAROLINE: I'll just phone the detective, just to be on the safe side. PHIL:(coming in through the back door) I wouldn't, if I were you. CAROLINE: Phil! Why did you come the back way? PHIL: Oh, erm...so the police wouldn't see me. PAUL: Is Christina with you? PHIL: Um...no. That's why I er...has to come in the back way, so the police wouldn't realise. PHIL: Well, the bottom line is, if you ever want to see Christina again alive, you'll both do exactly as I say.